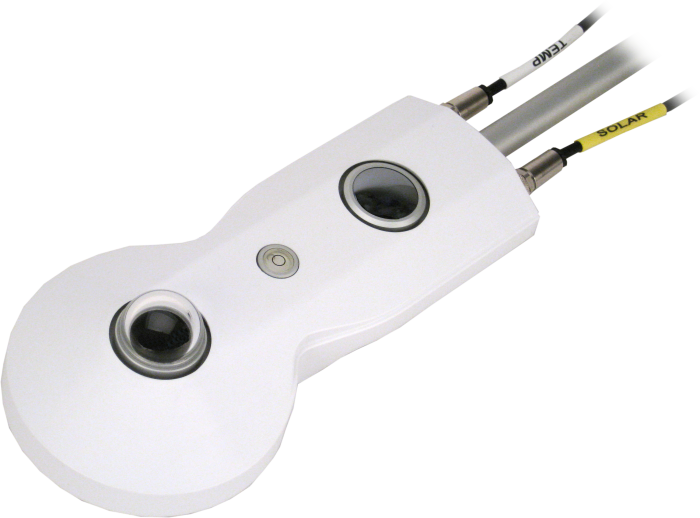 The CNR4, manufactured by Kipp & Zonen and cabled for use with Campbell Scientific data loggers, is a research-grade net radiometer that measures the energy balance between incoming and outgoing radiation. Our data loggers measure the CNR4's output. This net radiometer offers a professional solution for scientific-grade energy balance studies. The CNR4 consists of a pyranometer and pyrgeometer pair that faces upward and a complementary pair that faces downward. The pyranometers and pyrgeometers measure shortwave and long-wave infrared radiation, respectively. The upper long-wave detector of the CNR4 has a meniscus dome that allows water droplets to easily roll off of it. The dome shape also increases the field of view to nearly 180° instead of 150° for a flat window. The CNR4 contains both an internal thermistor and an internal Pt-100 RTD. Typically, the thermistor makes the instrument housing temperature measurements used to compensate the infrared readings. Alternatively, the RTD can provide these measurements if a CR3000 or CR5000 datalogger is used. The CNR4 has a solar shield that reduces the thermal effects on both the short-wave and long-wave measurements. A drying cartridge helps keep the radiometer’s electronics dry. The CNF4, an optional ventilation unit with heater, can be fitted onto the CNR4 to minimize the formation of dew as well as melt frost. Compliance Conforms to the CE guideline 89/336/EEC 73/23/EEC. CR1000 When using a CR1000, the internal temperature of the CNR4 should be measured with the internal thermistor. To avoid shading or reflections and to promote spatial averaging, the CNR4 should be mounted at least 1.5 m above the ground or crop canopy and away from all obstructions or reflective surfaces that might adversely affect the measurement. The CNR4 can be attached to a vertical pipe or horizontal crossarm. To do this, first connect the radiometer to its mounting rod. The mounting rod then attaches to the pipe or crossarm via the 26120 Net Radiation Sensor Mounting Kit. The kit includes adjustment screws for leveling the CNR4. The 26120 can withstand winds up to 120 mph. Four differential channels or four single-ended channels are used to measure the radiation components. A voltage excitation channel and an additional single-ended channel are required to measure the thermistor. If the RTD is used to provide the temperature compensation measurement, a current excitation channel (only available on the CR3000 and CR5000) and a differential channel are required. If a CNR4-L is connected to a data logger by cable for a distance of 60 to 70 m, does the CNR4 analog signal need to be amplified? Yes. The signal from this sensor is not great enough to compensate for its dissipation because of the cable length. Which net radiation sensors can be mounted using the 26120 mounting kit? Where should a net radiometer be installed? Mount the net radiometer so that no shadow will be cast on it at any time of day from obstructions such as trees, buildings, the mast, or the structure on which it is mounted. Campbell Scientific recommends installing a net radiometer in an open area, away from the main weather station structure on a separate vertical mast. If it is necessary to install this sensor on the main tall tower (30 ft or taller), the sensor should be installed at the top of the tower. In the northern hemisphere, the sensor should be facing south. In the southern hemisphere, the sensor should be facing north. If the tower uses a solar power system (that is, solar panels), ensure that the solar panels are installed away from the main tower. When a 4-way net radiometer is used, which data loggers require the use of a 4WPB100 to measure the internal PRT? The CR1000 requires a 4WPB100 to measure the internal PRT. (Data loggers such as the CR3000 and CR5000 have the necessary PRT bridge module built in to measure the PRT.) Note that the CNR4-L also includes an internal thermistor, which can be directly measured by the CR1000. Because of this, when using a CR1000, Campbell Scientific typically recommends monitoring the internal temperature of the CNR4-L using its internal thermistor instead of the PRT. Technically, because albedo is the fraction of the sun’s radiation reflected from a surface, albedo cannot be quantified at night. When calculating albedo, it is important to remember that when radiation readings are very low, there is a significantly large error associated with the ratio. For example, as the sun drops to a lower position on the horizon, the ratio of reflected and incoming radiation becomes somewhat meaningless. Albedo can be calculated from the simultaneous incoming and reflected pyranometer readings, with the average stored. Both of these pyranometer signals should be in a differential input mode. In contrast, the lower pyranometer faces the ground, which could be warmer or cooler. The readings are unlikely to be positive, and may even be -2 W/m2. In principle, two negative values could result in a night-time albedo of 0.5. Because of the input resolution, noise, and offsets of the data logger used, it is highly unlikely that any individual pyranometer reading is exactly zero. Depending upon the configuration used, any positive irradiation values recorded by the data logger as less than 2 W/m2 may, actually, be less than zero. Another approach is to just not calculate albedo when the flux values get small. For example, set a cut-off point for the minimum flux value that will be used in albedo calculations. If solar position is being calculated, one other approach is to use a solar position calculation, such as 1° above the horizon.